This TV Ceiling Mount Holds Large Flat Panel Televisions! The Bracket Tilts Downward 25 Degrees! 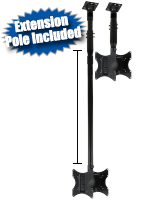 The TV Ceiling Mount has an Extra-Length, 73" Design! TV Size Range: 32" to 47"
Distance from Ceiling [to center of bracket]: 41" to 73"
ENTER CODE W53VJ IN CART TO TAKE $25.00 OFF THIS ITEM! 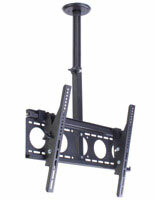 This extending TV ceiling mount is much longer than most other LCD brackets for sale online. A maximum extension length of 73", makes this unit ideal for businesses with taller ceilings and establishments needing more flexibility in display height. 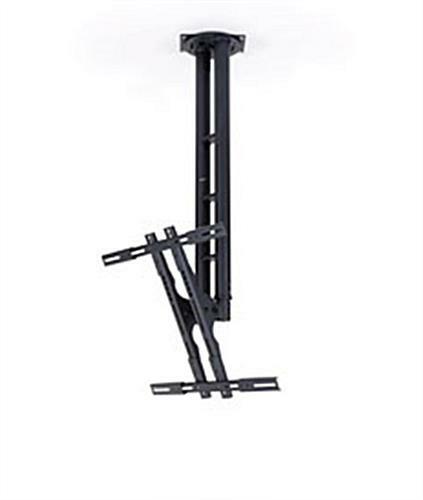 Most commercial TV ceiling mounts have a maximum length of approximately 60", but these black LED television brackets shatter those restrictions thanks to an ingenious design. The combination of steel construction makes this unit incredibly durable, and capable of holding flat panel LCD screens weighing up to 110 lbs. 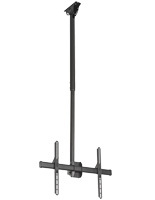 The TV ceiling mount that has an adjustable length features a matte black finish appropriate for use in any business advertising with digital signage. An adjustable tilt of 25°, ensures your customers will be able to effortlessly see the advertising content displayed on the monitor. 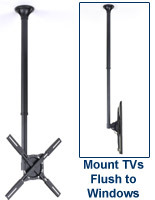 This TV ceiling mount that extends from 41" to 73" long can exhibit a monitor in horizontal or vertical format. At the top of the unit, where the pole meets the mounting plate, users can rotate the bracket 360° once the set screws are removed. 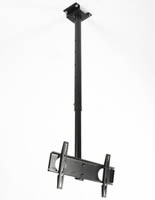 Each TV ceiling mount has cross bars with extenders, which allow screens ranging in size from 32" to 47" to be exhibited in horizontal or vertical format. The extenders ensure no portion of the bracket protrudes from the behind the monitor. The extraordinary versatility of this TV ceiling mount that is heavy duty makes it appropriate for advertising in many areas of a business. Commonly, these brackets are seen on showroom floors, playing dynamic digital content for shoppers while they browse merchandise. Another innovative way these displays can be used is in storefront windows to draw passing customers into a store. 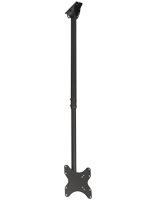 This extra-long TV ceiling mount allows retailers to display mannequins and other store fixtures in their windows while simultaneously playing digital content. All while taking up no floor space with bulky floor-standing flat panel stands. 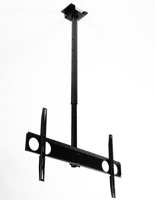 In addition to the bolts and anchors necessary to fix this tv ceiling mount in position, hardware is included which is compatible with most television VESA mount holes. An extra-long length, swivel, tilt and heavy duty capacity makes this LCD bracket the best product available for advertising with digital signage!